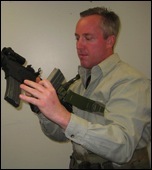 Dry practicing combat or emergency reloads is the best way to hone these rifle skills. Let's face it, whether you are shooting competition or in the shootout of the Armageddon an empty weapon is not a good thing. Here is a walk through of the reload procedure. 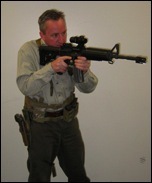 Step 1: Upon realizing that the bolt is locked to the rear, immediately rotate the weapon toward you at eye level, releasing the magazine at the same time. If the magazine falls free, GREAT! If not don't worry we'll fix that in a second. Whatever you do; Don't interrupt the course of the support hand from its destination: the replacement magazine! 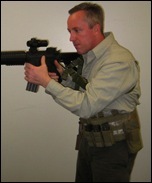 Step 2: Bring the magazine to the weapon and insert. There are many ways to grip the magazine. 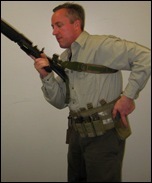 Gear generally determines the way in which you grip the magazine. No one style is any better than the rest as long as you are consistent. Here is where we clear that pesky magazine that didn't fall free. Grasp the new magazine with the thumb and pointer. Wrap the other fingers around the magazine and give a slight tug. The magazine will fall free. Step 3: Weapon Back in Battery. Slap or press the bolt release. I've seen Shooters use the charging handle to release the bolt. There is nothing wrong with that however, with the weapon in a different position, the charging handle may become fouled in the sling or other gear. The fewer outwardly moving parts, the better.